This week on the Great British Bake Off the theme was desserts. The contestants first challenge was to make a multi-layered torte. I always thought a torte was kind of like a tart, but apparently it’s more cake like and usually has a few layers involved, although not always. They weren’t allowed to use standard flour either, which gave the bakers the opportunity to use different types of flour such as potato and chestnut. There are so many different types of flour and it’s interesting to see the bakers be creative with a technical aspect of a bake rather than the aesthetics. 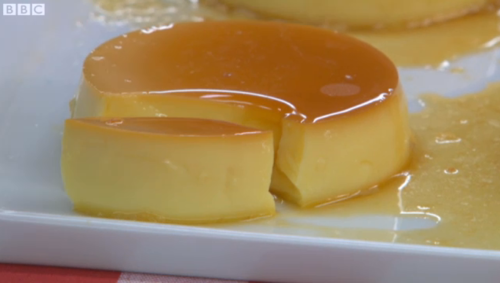 The second challenge was creme caramel (pictured above). It is a relatively simple concept – custard with a caramel coating – but the brief instructions the bakers were given caused confusion! Some contestants used egg yolks only in the custard, and others the whole egg. Of course, everyone had problems making the caramel, which is a problem I can definitely sympathise with! 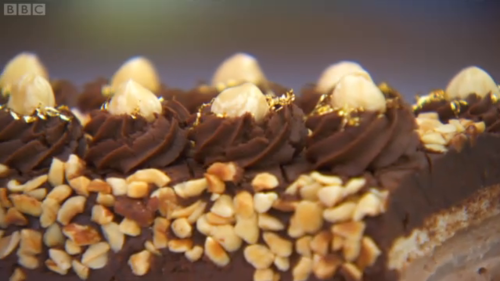 The final challenge was a show stopping layered meringue that the bakers has 6 hours to create. Above is my favourite contestant Brendan’s Pear, Chocolate and Hazelnut Dacquoise, which was a huge hit with the judges! I’m pleased he did well as last week he struggled. Stuart left in the end which I was sad about, as I think he had a lot more to give, and I love how creative and brave he is. He reminds me of myself, I am always having grand ideas, but they never turn out how I imagine! Out of the 3 challenges I chose to make the creme caramel. My creative juices aren’t flowing much at the moment (baker’s block?) so a technical challenge suited me just fine! I followed a Delia Smith recipe, and I started by melting 175g caster sugar on a low heat. I stirred it gently as it melted. I took the pan off the heat, added 2 tablespoons of hot water and stirred some more. Then I quickly poured the caramel straight into 4 ramekins. Do this quickly, the caramel cools and goes solid very fast!! I also put the ramekins into a deep roasting tray for transferring to the oven later. Then I began making the custard. I poured 150ml of whole milk and 275ml of single cream into the pan that had the caramel in and whisked it over a low heat until the remaining caramel melted into the cream mixture. In a bowl I beat 4 eggs together, then poured in the cream mixture, whisking constantly as I poured. Once it was all mixed in, I added 1 tsp. of vanilla extract and mixed again. I poured the mixture into the ramekins on top of the caramel through a sieve. The sieve caught any crystallised lumps of caramel in the custard. Then I filled the roasting tray with hot water until it came up to about two thirds of the ramekins height. This is called a bain marie. I baked the creme caramels on 150C/300F/Gas 2 for 45 minutes. The recipe said 1 hour and 15 minutes, but after 30 minutes they started browning on top, and after 45 minutes I decided to take them out as they were firm on top. After leaving to cool, I turned out the creme caramel and was very pleased! The caramel sauce was lovely and golden., the custard was firm and set all the way through. A great result if I do say so myself!